Imagine… that Robin Hood Coop shares were registered on a blockchain and their value was marked-to-market every day. For starters, this would make the shares much more liquid. Members could easily and instantly buy and sell their shares to and from each other on a blockchain-based marketplace (an after-market, or secondary market, so to say). Then, in essence, this would transform the share into the world’s first crypto-asset which is backed by a portfolio of stocks. Imagine a “Bitcoin” backed up with a real assets like that! Or even more precisely, the Robin Hood share would become a smart asset backed by the dynamic portfolio of company stocks whose future is shown to be the most promising by the emerging consensus action of the best big players at the market. It is not a bad place to have your money in. Sure, the market fluctuates, but it is difficult to think anything less insecure than equity in such companies. Another financial innovation engineered by Robin Hood R&D team. But there is more. This could mean that members can directly command their money, what it does, with whom it cooperates and how. The members could allocate their support for certain Robin Hood projects directly, without a decision by the AGM and/or the board. This would be a big step towards a more dynamic and more distributed coop, coop 2.0 – the one we need for of the 21st century. It could mean that we can also issue shares that can be easily managed by Parasite’s little sisters or by another new algorithm or method. And it could mean that any member or group of members can start their own hedge fund “powered by Robin Hood” or “Robin Hood inside”. We are happy to announce that this “imaginary what if” is to become reality. RHC has partnered with HitFin, Inc., to develop a blockchain based share management system and the marketplace. At the same time, Robin Hood is planning to move from issuing 30€ nominal value shares to the more familiar model, where members can invest in voluntary shares with any amount of euros, dollars or Bitcoin. There are a lot of details to discuss, lots of possibilities opening, and – no doubt – also some hurdles and problems ahead. So let’s start! The development we are doing with HitFin consist of two parts: a new payment integration system and a member/share register on the blockchain (including the secondary market). The work has started this week and should take ca. 3 months. Never dull here is it! Interesting times. Can you give a rough idea of how that would work if the marketplace were running today and I wanted to sell a few shares that I have paid €30 for? All current members shares will be transformed to the new form. So your account would show that you have €30 of shares at the current market rate (for each of the shares that you would have). You can choose which portion of this amount you would like to offer for sale on the secondary market (based on the current valuation you may decide to offer a small discount to make a quicker sale). Another member could make an offer. When you both agree and once payment has been made the values of shares would be assigned to the other member. I can see the appeal of the marketplace, by the same token, I don’t want you guys to fail because of the whims of a money market that decides our €30 are worth 30 cents. Is there a way to protect a % of our share, so that even if the open market created by the coop we have invested in, sticks a finger at the market value of a “€30” share, we still have a coop? Maybe the easiest way to have the marketplace would be to have it as a market also in the sense that members can offer their shares at any price they want, and other members can then buy them, if they see fit. Supply and demand. Is there a way to protect a % of our share, so that even if the open market created by the coop we have invested in, sticks a finger at the market value of a “€30” share, we still have a coop? A related idea has been floated: what if a part of the profit made for Robin Hood Fund would be siphoned off from the stock portfolio into some stable holding at regular intervals (once a month? every quartal?). There are several things to take into account here, including the workload, the leverage the Parasite is working with, etc. members can offer their shares at any price they want, and other members can then buy them, if they see fit. With regards to your point @Andy - this is the main point. Shares can only be purchased by other members. To be a member you’ll need to retain one mandatory share/s (€30 euros worth) and have purchased the membership fee (€30 euros). Those are the two parts which give full access to the mechanisms of the co-op. In that sense then it is the demands and supplies from within the co-op (+ the market valuation of the portfolio) which will be the main drivers of the valuation. To be a member you’ll need to retain one mandatory share/s (€30 euros worth) and have purchased the membership fee (€30 euros). Those are the two parts which give full access to the mechanisms of the co-op. It should also be noted that these two parts of a members holdings won’t be available for sale through the members market. To sell the mandatory share the member will need to sell the share back to the co-op itself. 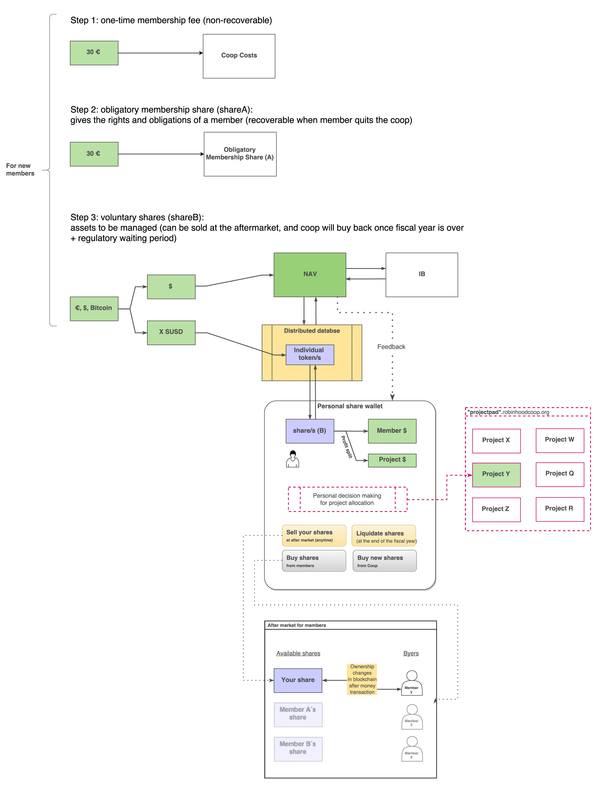 Here is a picture of how the new system is thought to work (click for a bigger version, and download if you want to zoom in at will). From the perspective of a new member, the two first steps are the same as before (with the difference of more payment options and a smoother user experience, we expect ). The new stuff begins in step 3. When buying voluntary shares, euros or bitcoins or other currencies are first exchanged into a cryptocurrency used by the system. However, the member does not neet to worry about this exchange, as it happens automatically. Then this cryptocurrency is used in buying shares in the coop. The member can use any amount to buy shares, at a price updated daily (“amount X gives you amount Y in shares”). The shares are then registered on the blockchain. Then shares – or parts of shares – can be sold at the after market; a member can ask for a price, and another can decline or accept it. Once transmission of payment is confirmed, the shares change ownership. Also, if we want, the allocation of funds to projects can be arranged in a new way. A member can directly allocate the profit accumulated for projects from her/his wallet to the project of his/her choosing. The allocation is realised and the project gets the support when the coops books are closed (at the moment, in the end of the fiscal year, but could also happen more frequently). This system might facilitate a more interactive relationship with the projects, a more organic growth of the commons. This is extremely exciting, I would invest just to be a part of this historic development (crypto assets pegged to traditional stocks). I would love to read more about the technical details of making this work, since it will undoubtedly inform future pioneers wanting to create similar services on the blockchain! Tested Ethereum some days ago. As with Bitcoin, its blockchain has grown HUGE (currently for Bitcoin, it is 65 Gb), as has with Ethereum (8 GB as of feb 16, 2016). This is a technological roadblock for distributed network and leads to centralization. On the other hand, Microsoft has announced its interest in Ethereum. There are other platforms where coops shares could be stored - NXT and BitShares. Of all the three, Bithares currently is the quickest - confirmations take under one minute. Also, Bitshares have built-in framework for regulatory conformance (at least according to the writings of its authors), and is designed for millions of transactions per second. The block size and other cost factors, and especially centralisation are certainly issues we – not only RHC but the wider community – have to keep an eye on. It is interesting to see how many actors are, presumably for reasons like this, thinking and building solutions that are “blockchain agnostic” in one way or another. Thanks for the input - you’ve gotten straight to one of the contradictions that lies at the heart of the centralisation at the center of many decentralised ledger technologies. With regard to which blockchain to use for the representation of shares it should be noted that a traditional SQL representation will also be maintained so that we can make sure that we do not have one central point of failure. It should also be noted that the infrastructure that is being developed currently abides by principles of microservices available through API interfaces. The ideal for future developments will be that the system is blockchain agnostic. Speaking of which, we are actively looking at implementing aspects of the Freecoin toolset which has been developed as part of the D-CENT EU project - which at the moment interfaces with NXT. We’re also in discussion with Enric from Faircoin to see how our developments can drive in a direction that allows for future cross compatibility. In short - we’re trying as best we can to consider multiple routes to make sure we can be responsive to such a fast changing field. Is not the key advantage of Ethereum over all other blockchains the “smart contract”? Sure it is slow right now… but individual buy and sell contracts of something like Robinhood Co-op don’t need to be super fast… I mean how long does it take to move funds in and out and buy and sell in and out of a standard managed fund? Days? it’s the autonomy and transparency of the smart contract part of this that makes Ethereum so potentially powerful. We follow with interest and look forward to participating in the co-op when it’s moved onto Ethereum. And yes, you’re right. In part it is the capacity and possibility of ‘smart-contracts’ to make otherwise quite complex tasks, automating and inter-active. Hello All, I am a little one here but sounds exciting and huge to me, nevertheless my understanding is very limited, please, is there someone who could explain in simple language. ? As well, how should I prepare myself technically for the next level ? As time goes on, more new features will be introduced. The plan is to prepare proper how-tos on these before they are introduced. All this stuff will be usable via a regular browser, no new tech or tech skillls needed. In regards to the blockchain size and Ethereum, there is a lot of active development for ‘sharding’ and ‘Proof of Stake(PoS)’ techniques that will address the scalability/size issue of the blockchain as the platform matures. Sharding will allow the chain to be split into smaller chunks while maintaining its integrity with the same cryptographic assurances as before. The feature set of the network and the explosive growth happening right now in the Ethereum ecosystem make it an ideal fit for the Robin Hood project!